We were delighted to be asked to take part in local radio station RadioPlus’ advent calendar. 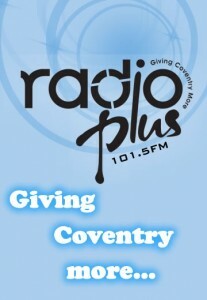 Each day, the RadioPlus advent calendar features a different Coventry charity on air and an opportunity to get involved. Today, it was Kairos WWT’s turn to open it’s door and tell listeners more about our organisation. You can hear our message here: Kairos Advent Calendar. If you’re interested in the volunteering opportunities mentioned in the feature, please visit this link for further information. Radio Plus provides responsible and entertaining radio in the Coventry, Warwickshire and surrounding areas in association with voluntary organisations, local authorities, local residents, community groups and businesses in a common effort to strengthen society.You can tune in to RadioPlus on 101.5 or listen live via their website. Our thanks go to RadioPlus for the opportunity to be part of a wonderful initiative and for helping us to share our message.